From the Panhandle to the Everglades, spring is blooming in Florida! Many of the state’s spectacular wildflowers can be seen right from your car window; others can be found a short walk from parking lots of the state’s most accessible parks and recreation areas. And you can identify them using a new book from University Press of Florida, Florida Wildflowers in Their Natural Communities, a full-color guide to 450 species, organized by where the flowers are most likely to be found growing – their natural habitat. Pack the guidebook, take a weekend drive and see for yourself the colorful treasures of Florida’s special flower spots. The trip begins in Jackson County in northern Florida, where a variety of wildflowers such as Florida flame azaleas, blue phloxes and bloodroots, can be found. The Florida flame azaleas are endangered but can be seen in yards as decorative shrubs. This bright orange and yellow flower has long pistils shooting out beyond the petals. Blue phloxes have rich lavender petals. Long-stalked white flowers decorate the odd-shaped leaves of the bloodroots. Visit either Florida Caverns State Park or Three Rivers State Recreation Area to find these and many more wildflowers. Suwannee County, east of Jackson, is the third destination. To find plants such as greeneyes and sundial lupines, with its small purple flowers, try visiting Ichetucknee Springs State Park or Suwannee River State Park. Alachua County is next on the list of places on the way south. Keep your eyes open for innocence and squawroots. Innocence plants are decorated with small, four-petaled, white flowers. The odd-looking, brownish-yellow squawroot resembles a fir cone, and this terrestrial parasite is close to the ground. A recommended spot to find these wildflowers is O’Leno State Park. To see flowers such as the deep-pink cone-clustered lady lupine and glove-shaped lavender Ashe’s savory, make a stop at Marion County, just south of Alachua. To find these delightful flowers and many more, visit the Ocala National Forest. A little farther south is Lake County, home to a variety of wildflowers. When passing through this county, stop at Rock Springs Run State Reserve. Keep an eye open for dewberries, pale grass-pink and hatpins. The dewberry flower has five petals colored white, pink or rose. Pale grass-pink blooms have an orchid shape and may be hard to find because they’re threatened in Florida. Hatpins, as the name suggests, have a needle-like appearance with long, thin stems and a whitish yellow flowered top. After Lake County, stop to see what’s blooming in Brevard. The Canaveral National Seashore is a wonderful place both to visit and to look for wildflowers. In this area, look for the picture-perfect beach sunflowers, identifiable by their yellow ray florets, and the coral bean’s red, elongated flowers arranged in a long spike. The last stops -- at the bottom edge of the state -- are Dade and Monroe counties. Starting in Dade, drive through Everglades National Park, where you might find the rockland ruellia, which has a showy lavender flower. Also look for the white-petaled pineland clustervine and the orange-yellow Bahama senna. To become better acquainted with what you can find in each county Florida Wildflowers in Their Natural Communities presents detailed descriptions and colorful pictures of the wildflowers. The book, used to map out this Florida flower spring tour, also suggests other places to visit. The following parks are open from sun rise to sunset. The distance in miles given are just approximations. All prices listed below include one vehicle, up to 8 people. Florida Caverns State Park (850)482-9598: near the city of Marianna; price of admission is $3.25; starting at U.S. 231 south, take State Road 73 for east 7 miles to U.S. 90 east for 1.5 miles to Highway 166 north for 2 miles until you get to park. Look for these flowers: two flower medic, allegheny spurge, wood-nettle few-flowered croomia, wild columbine, wake robin, may apple, jack-in-the-pulpit, false rue-anemone, Indian pink and atamasco-lily. Three Rivers State Recreation Area (850)482-9006: near the city of Sneads; $2.00; get back on U.S. 90 east for 20 miles to Highway 271 north for 2 miles until you get to park. Look for these flowers: cross-vine and trilliums. Suwannee River State Park (904)362-2746: near the city of Live Oak; admission price $2.00; get back onto Highway 271 south to U.S. 90 east for .25 mi. to Highway 280 south for 5 miles to Interstate 10 east for 98 miles to Highway 255 north for 3 miles to U.S. 90 east for 8 miles until you reach the park. Look for these flowers: fall gromwell, narrow-leaf pawpaw, persimmon, styloden, skullcap, dollar weed and downy phlox. Ichetucknee Springs State Park (904)497-2511: near the city of Fort White; admission price $3.25; get back onto U.S. 90 east for 7 miles to Interstate 10 east for 11 miles to U.S. 129 south for 30 miles to U.S. 27 east for 8 miles until you reach the park. Look for these flowers: red buckeye, pineland ginseng, slender beard tongue, New Jersey tea, southern black haw and fall gromwell. O’Leno State Park (904)454-1853: near the city of High Springs; $3.25; get back onto U.S. 27 east for 7 miles to Highway 18 east for 7 miles to U.S. 441 south for 4 miles to Route 2 for about 2 miles until you reach the park entrance. Look for these flowers: Carolina rock-rose and horse sugar. Marion County: Ocala National Forest (352)625-2520: get back onto U.S. 441 south for 10 miles to Interstate 75 south for 52 miles to State Road 27 east for 12 miles to Highway 40 which takes you through the national forest. 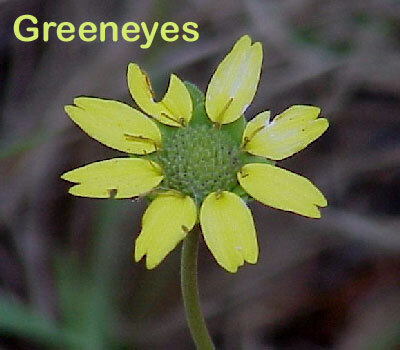 Look for these flowers: greeneyes. Lake County: Rock Springs Run State Reserve (407) 884-2009: near the city of Sorrento; $4.00; get back onto Interstate 4 and take exit 51 to State Road 46 west; the park is on the left side 7 miles down this road. Look for these flowers: sandhill milkweed, Florida dandelion, coral bean, dwarf huckleberry and crow poison. Brevard County: Canaveral National Seashore (407)267-1110: near the city of Titusville; admission price $5.00; get back onto U.S. 441 east to Highway 436 east for 9 miles to Interstate 4 north for 13 miles to Highway 46 east for 37 miles to Interstate 95 south for 4 miles to exit 80 and go east on Garden Street, go east and this road will take you through to the park. Dade and Monroe Counties: Everglades National Park (305) 242-7700: admission price $10.00; get back on Interstate 95 south for 295 miles (which will turn into U.S. 441 in Miami) to State Road 9336, which takes you through the park. Look for these flowers: coffee colubrina, hairy tournefort, snowberry, ground cherry, joewood, possum grape, Spanish leather and Boykin’s polygala. Florida Wildflowers in Their Natural Communities is written by Walter Kingsley Taylor, professor of biology at the University of Central Florida, Orlando. The guide, the first of its kind for Florida, helps readers identify wildflowers by where they’re most likely to be found growing—their natural habitat. Taylor provides detailed descriptions and color photos of each community—pine flatwoods, sandhills, upland pine forest, scrub, temperate hardwood forest, coastal uplands, subtropical pine forest, tropical hardwood hammock, and ruderal sites—and of the wildflower species associated with each. For a colorful display of wildflowers (and to download jpeg images of flowers) check out the University Press of Florida website at: http://www.upf.com/bom/jan.html. Courtesy of the University of Florida Press.